29 February 1960 Oddities in City street names; those inspired by City defences, streams, markets, religious houses, geography, trades and crafts, property owners, famous people, royalty and inn signs; ad hoc process of street naming in Middle Ages and since. 30 May 1960 Long City history of feasts and good cheer; Livery Company dinners; Mayor’s feasts in their own homes before Mansion House built; Audit and Lighting-Up Dinners; famous Corporation dinners; royal entertainments in the City. 29 August 1960 Port of London Authority since 1908; personnel, constitution and work of the PLA respecting Thames conservancy and operation of the closed docks; staff of the PLA, including the Dock Labour force; engineering works and development; Second World War damage and its aftermath; finances of the PLA; trade in the Port of London and table of tonnages handled since 1931, including some specific commodities. 7 November 1960 Growth of London, especially the initial expansion outside the City walls in Tudor times; area of the Bills of Mortality; 16th and 17th century maps and surveys; paving of roads; population and density; main causes of growth; efforts to limit growth and their lack of effect; effects of the growth of London; comparison with recent Royal Commission limiting the size of London, and the probability of yet further growth. 30 January 1961 Imaginative account of what might have passed before a person standing at the corner of Newgate Street and Old Bailey at various times from Roman times; Smithfield and St Bartholomew’s Hospital; jousts at Smithfield; Bartholomew Fair; the meat market; burning of heretics; Holborn Viaduct; Central Criminal Court; public executions outside Newgate Gaol until 1868; Elizabeth Fry; Newgate Market; Christ Church, Newgate; famous occupants of the area. 29 May 1961 John Carpenter’s bequest 1442, and its enunciation in the will of John Don, 1477; Warren Stormes Hale and the establishment of the City of London School in Milk Street in 1837; School’s successes; scholarships and benefactions; move to Embankment in 1883; recent suggestions to rusticate the school; playing fields; current successes. 31 July 1961 Brief biography of Charles Dickens based on John Forster’s biography. 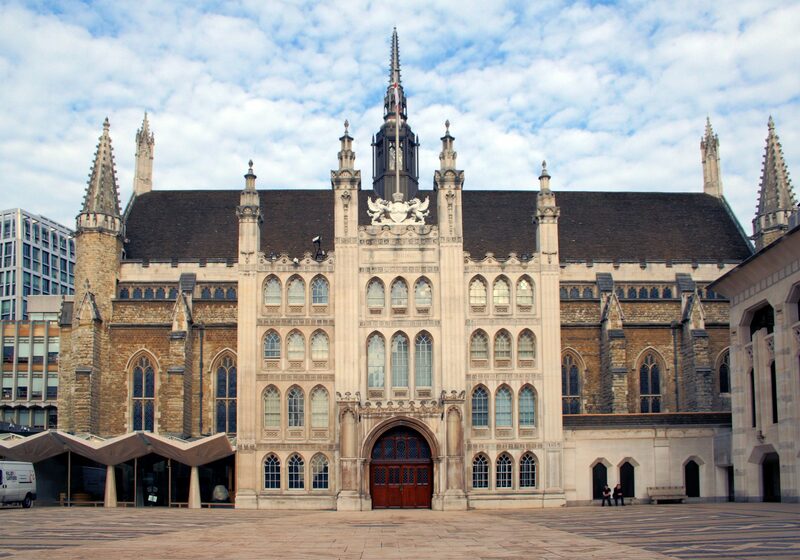 30 October 1961 Building and alterations to the Great Hall of Guildhall since 1411; precursors of the 1411 Guildhall; suggests that the then ruined western crypt was under the pre-1411 Guildhall, and that the 1411 Guildhall was an extension, not a new-build, of the former Guildhall eastwards, with evidence and plan; collapse of west crypt in Fire of London 1666; evidence that the western crypt was built before the eastern and the Great Hall; plea from the author not to damage the western crypt further when the new Guildhall buildings facing Aldermanbury are being built, and to look out for the foundations mentioned by Stow when work was under way. 29 January 1962 Examples of the work of Chamberlains of London since the 14th century; the common round of a mid-20th century Chamberlain’s work; ceremonial and outside engagements; change in office hours; Chamberlain as banker and treasurer and his direct access to the Bank of England; Chamberlain’s Court, City Freedom and Livery Company matters; plate indenture; historic problems of Chamberlain’s such as military expenditure in the 17th century; the Great Fire of London 1666 and the coal duty; précis of the position of the Chamberlain. 30 April 1962 Shakespeare in London from about 1592; conjecture about the “lost years” 1584-1592; London’s theatrical context; Shakespeare living in St Helen’s Bishopsgate c. 1596-1599; moving of Burbage’s theatre from Shoreditch to Bankside as The Globe; growing success; living with the Mountjoys in St Olave’s Cripplegate; his purchase of the gatehouse of the old Blackfriars priory (conveyance held by Guildhall Library); his will, death and burial at Stratford; the publication of his plays and his reputation. 23 November 1962 Current feelings on the recent demolition of the Coal Exchange; various locations of coal marketing; wealth and nature of coal trade; Corporation’s purchase of the Coal Exchange under Act of Parliament of 1803, and free market thereafter; building of Bunning’s new Coal Exchange in 1848; war damage to the building; subsequent make-do-and-mend; changes in the coal trade overtaking the need for a central coal exchange; proposals to demolish the building for road improvements and detailed account of the fight to prevent it or re-locate the building; possibility of future criticism of the Corporation for destroying a Bunning masterpiece and comparison with Temple Bar, which has “raised its head again and again”. 31 December 1962 Relatively short span of medieval merchant families in London compared to the Continental cities, and causative factors; substantial immigration from the provinces to London a vital necessity and how it happened; the enormous numbers of successful immigrants and examples; trades linked to places; county societies in London; Yorkshire families continuing links in London, including the Skilbecks. 29 April 1963 Foundation of Museum in 1826 and its subsequent development; wartime evacuation of exhibits; post-war increase in collections due to redevelopment and archaeology, but Museum space colonised by Guildhall Library bookstacks to maintain library service; temporary measures; 1912 Cheapside jewellery hoard and Treasure Trove laws in the City; excavations at the Temple of Mithras, Bucklersbury; Bucklersbury mosaic pavement; Livery Company collections; touring exhibitions; details of the then impending merger between the Guildhall Museum and the London Museum to form the Museum of London. 29 July 1963 Election at Common Hall at Midsummer each year of 4 aleconners; office a sinecure since at least 1755 and no duties; medieval assize of ale and origin of aleconners; growth of beer-making from the 14th century; attempts to regulate the trade through City Companies; John Stow a 16th century aleconner; Surveyors of Ale and Beer united in 16th century; diminishing income of aleconners from late 18th century; aleconners in manors elsewhere; constitutional oddities illustrated by the history of the aleconners. 2 October 1963 Opening of the first underground railway in the world in 1863 between Paddington and Farringdon Street, conceived by Charles Pearson, Common Councilman, MP and City Solicitor 1839-1862; brief biography of Pearson and his achievements; unfulfilled dream of City rail terminus in the Fleet valley for all trains into London; Pearson’s work towards the Circle line instead, to link all the London termini and relieve traffic congestion above ground; similarity of London then and now; current digging of the new Victoria Line tunnels. 30 December 1963 Great popularity of music in medieval London; origin of waits in the 13th century as watchmen or guards; role in Midsummer Marching Watch; transition into musicians in the 15th century; pay, duties and silver chains, 14th -1 17th centuries; instruments and personnel; sale of offices in the 18th century; waits allowed to run down; last wait died in 1845. 6 April 1964 Origins lost in time; Trinity Houses elsewhere in the UK and their purpose; connections with the City from 16th century; royal charters and development of London Trinity House from 16th century; Elder and Younger Brethren and compulsory pilotage of shipping in London approach waters from 1604 Charter; lighthouse jurisdiction; Commonwealth dissolution and Restoration reconstitution; Samuel Pepys’s links with Trinity House and his foundation of the Mathematical School at Christ’s Hospital in 1673; role in the 1797 Nore Mutiny and 1803 threatened French invasion; lighthouse monopoly since 1836; current work and role of Trinity House. 29 June 1964 Two giants which strike the clock bells at the church of St Dunstan in the West; brief history of the church and environment; Thomas Harrys’s new clock on the church in 1671, the first to have minute as well as hour hands, and its fame throughout London; the clock in literature; church rebuilt in 1830 when Fleet Street widened, and clock sold to 3rd Marquis of Hereford for his new house, St Dunstan’s, in what became Regent’s Park; clock removed, repaired and restored to church by Lord Rothermere in 1935, the author’s firm removing and re-erecting it; details of the condition of the clock and necessary repairs; the giants’ favourable comparison with the Guildhall’s new Gog and Magog; album of photographs of the restoration given to Guildhall Library. 31 August 1964 Why the City’s jurisdiction did not expand to the whole Metropolis, in the light of the impending creation of the Greater London Council; forces historically diminishing the power of the Corporation; Royal Commission on Municipal Corporations, 1837; 17th century expansion westwards, especially after Fire of London in 1666; speculative builders; waves of new building and factors affecting expansion; factors against the Corporation’s expansion of jurisdiction; 19th century Royal Commissions, their recommendations and the Corporation’s responses; new municipal reforms of 1965. 30 November 1964 Links between London citizens and America from the 16th century; the foundation of the Virginia Colony at Jamestown in 1607; Virginia Company and the Common Council’s sending of poor and vagrant children to Virginia in 1618-1619; 18th century transportation and indentured servants sent from London to America; London tea-merchant’s link with the Boston Tea-Party; City’s support for the American rebels in 1775. 29 March 1965 Growth of Guildhall Art Galleries collections from the 22 Fire Judges’ portraits commissioned by the Corporation from Joseph Michael Wright c. 1672 and their subsequent history; commissions and benefactions to the Permanent Collection; foundation of the Guildhall Art Gallery in 1885 under Sir Alfred Temple; enormous success of his loan exhibitions in 1890 and 1892; further acquisitions; Second World War destruction of the Art Gallery; post-war make-do-and-mend and temporary exhibitions; brief résumé of the best items in the Permanent Collection; loans of pictures; plan for an art gallery in the proposed Barbican Centre. 31 May 1965 3rd Ceremonial Officer of the Lord Mayor’s Household; City Marshal first appointed in 1589 to apprehend vagabonds; wider duties of two City Marshals relating to law and order from the early 17th century; marshalmen and 18th century disputes as to their appointment; election in Court of Common Council, admission in Court of Aldermen from 1778 and duties since then, both in law enforcement and ceremonial duties; unification of office into one person from 1862; current duties; list of office-holders since 1589. 30 November 1965 Development of the culinary arts in ancient Greece; dining habits and furniture; design of drinking cups; etiquette; oblations and dedications of successive cups of wine to the gods; wreaths and perfumes associated with wine-drinking; toasts; president of the feast; richer wines with desserts; Pliny the Younger’s description of a cheap-skate’s dinner; continuation of many ancient usages today. 31 January 1966 Grand plans for the aftermath of the fire not practical for the City merchant; private rebuilding after the Fire; Mills, Hooke and Oliver appointed surveyors under the Rebuilding Act 1667; brief biographies of the three; their work; Mills’ and Oliver’s surveys now in Guildhall Library; private sector rebuilding substantially complete by 1671; difference in speed of rebuilding between 1666 and 1946; lack of insurance in 1666; the Fire Court and its Decrees; use of these in proving Corporation title to parcels of land currently. 31 October 1966 Concentrates on royal entries of Henry V after Agincourt in 1415 and Charles II’s birthday entrance on the Restoration in 1660; a sketch of the City in 1415; celebrations of the victory at Agincourt from the moment it was announced; Henry V’s journey from Dover; very detailed account of City of London’s 1415 pageant; differences in the City by 1660, despite similarity of route; Restoration procession and celebrations in 1670. 29 December 1966 Curious numbering of premises in College Hill; historically one of the more important streets, linking the southern pair of the four main east/west routes through the City (Thames Street and Watling Street); rich area in the Middle Ages, occupied by Whittington; description of the area; foundation of Whittington College, St Michael Paternoster Royal, 1424-1548; developments and successive houses on the site of Whittington’s house; Turners’ Hall and Almshouses; Mercers’ School House; Tower Royal. Deputy T.E. Chester Barratt CBE, MA, LL.B. 31 July 1967 History of one piece of Corporation property (currently HQ of Rothschild’s merchant bank, New Court, St Swithin’s Lane, there since 1809) which has been in its hands for six centuries; details of ownership of the property 1346-1359, when the Corporation acquired it; details of tenants since 1359; plan of property in 1772; possibility of such site pedigrees to be compiled from the records of the City Lands and Bridge House preserved at Guildhall. 30 October 1967 Imminent retirement of the present Remembrancer, Sir Paul Davie; brief biography of Thomas Norton, first Remembrancer, appointed in 1571; initial duties of the office; Elizabeth I’s patronage of the second Remembrancer, Dr. Giles Fletcher; the Remembrancia; attempts by the Court of Aldermen to abolish the post in the mid-17th century; sale of office in 18th century; 20th century Remembrancers, including a thumb-nail sketch of the then Remembrancer, Sir Paul Davie; list of office-holders. 29 January 1968 Guildhall roofs 1411-1666, 1668-1864, 1864-1940, 1941-1953 and Sir Giles Gilbert Scott’s new roof, built 1953-1954; irregularity of existing columns; necessity and engineering details of strengthening foundations of columns before new roof could be built; all work done between Lord Mayor’s Days; account of the roof-building; keenness of workmen to work on Guildhall, even without productivity bonuses. 29 April 1968 The City as a market; changing its skin every 120 years: the increasing size of buildings and building phases; impact of railways; in 1945 one third of the City in ruins; to expedite redevelopment, Corporation in 1968 owned one tenth of the City; redevelopment units and new roads; major changes and future trends: offices replacing warehouses, increasing specialisation in financial sector; increase of containerisation instead of barge traffic, improvements in electronic communications; some predictions for the future. 29 July 1968 Baltic’s uniqueness as an international shipping exchange; dealing by word of mouth; location and building; business undertaken in the Baltic Exchange, comprising shipping, dealing in grain, oilseeds and oils and aircraft chartering; importance of the Baltic Exchange and the experience of those working on it. 31 December 1968 Background and biography of Samuel Whitbread and his setting up of his brewery in 1742; brewing in the Chiswell Street area; Whitbread’s use of the latest in engineering innovations; royal visit by George III and Queen Charlotte; Samuel Whitbread II and his partnership with Martineau and Bland of Lambeth; subsequent family members in the business; links with mayoralty coach and horses. Alderman Sir Edward Howard Bt. 31 March 1969 Brief biography of John Wilkes and his civic and political career; The North Briton and Wilkes’ arrest for seditious libel; his repeated clashes with government and his popularity; 1769 his most important year; Wilkes as a Liveryman, Alderman, Sheriff, Lord Mayor and Chamberlain; mellowing with age; summary of his character and accomplishments; the then current exhibition on him at the British Museum. 30 June 1969 Vestiges of the Corporation’s jurisdiction in Southwark; keeping of the Peace in Southwark from 14th century; brief history of the City’s jurisdiction in Southwark, especially the 1550 charter and the passing of the manors to the City; very detailed account of the procedure of Courts Leet; incipient publication of [David Johnson’s] book [Southwark and the City]. 5 November 1969 Earliest origins of Billingsgate Market as a general market in the roomland adjacent to the wharf; Queenhithe v. Billingsgate in the early medieval period; constant river and land traffic congestion; ferry from Billingsgate to Gravesend; bum-boats; author’s personal recollections of Billingsgate Market since 1918.